In the new issue of Rolling Stone, Brian Hiatt spends 5 days with Pearl Jam during their US Tour. 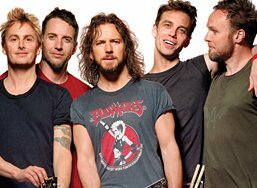 The interview, mostly with Eddie Vedder, gives a lot of (at least to me) persiously unknown information about my favorite band. After the album "Ten" hit and they won the Video of the Year for "Jeremy", Eddie got scared. Add to that Kurt Cobain's suicide and dealing with a stalker, Eddie wanted to dial down the hit making machine. The other members of the band, at the time, wanted to keep pumping out the hits and keep the glory machine going. Looking back, they agree that Eddie did the right thing. They're still around. They're still relevant. Personally, I have liked all of Pearl Jam's albums through the years (even between "Vs." and "Pearl Jam"). "At some point, Ed realized he was the central figure in the band," Gossard says. With his short hair and wire-rimmed glasses, he looks like he works at a dot-com. "If I was able to sing and create the kind of energy Eddie's able to create, I'm sure I would want the same ability to say, 'This doesn't feel right to me.' I think he could do a lot of different stuff, but he chooses Pearl Jam as the vehicle he likes. It's amazing to be part of that." I laughed at the "[Stone] looks like he works at a dot-com" and thought Stone's quote was cool. Eddie talks about how Johnny Ramone's death affected him, saying, "Half the record is based on the loss of the guy who turned out to be the best friend I ever had on the planet. And that was Johnny Ramone." I've read that the band (including Eddie) is very upset that RS put a picture of Eddie on the cover instead of the whole band. So, instead of getting to you buy the article, I'll tell you that the name "Pearl Jam" does not come from the old tale that Eddie's great-grandmother, Pearl, made mood altering preserves. Actually, Jeff came up with "pearl" and they added "jam" after seeing Neil Young jam. "He played, like, nine songs over three hours. Every song was like a fifteen- or twenty-minute jam," says Ament.